Whether at home or on vacation, boating, fishing, and swimming can be fun ways to enjoy the great outdoors. Safe Electricity wants to help you keep this time a safe time and is sharing the message, “If you feel a shock, swim away from the dock,” to help keep people safe from a hidden hazard called electric shock drowning (ESD). Outdated wiring and a lack of proper safety equipment and routine maintenance on docks and boats can cause such situations where electricity “leaks” into the water. According to the Electric Shock Drowning Prevention Association, between 10 and 15 milliamps, which is just 1/50 the wattage of a 60 watt light bulb, can cause drowning. They also report that many ESD deaths have occurred around private docks and boats plugged into shore power while docked. 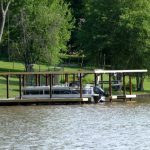 Safe Electricity recommends that individuals do not swim around docks with electrical equipment or boats plugged into shore power. If a person is in the water and feels electric current, that individual should shout to let others know, try to stay upright, tuck his legs up to make himself smaller, and swim away from anything that could be energized. Do not head to boat or dock ladders to get out – if possible, swim to the shore. All electrical installations should be performed by a professional electrical contractor familiar with marine codes and standards and inspected at least once a year. Regardless of the size of boat, maintenance of the electrical system should be done by an ABYC Certified® Marine Technician, a professional familiar with marine electrical codes. Have a boat’s electrical system checked at least once a year. Boats should also be checked when something is added to or removed from their systems. For more electrical safety information, visit SafeElectricity.org.